As I get older, I have become so much more attached to traditions and I grew up in a family for whom traditions are very important (as I have explained in other posts). I don't have lots to say about Easter this year other than that while it was reasonably simple, it all felt so meaningful this year. So often, it creeps up on me and we end up spending it in a frenzy and I feel like I have missed out. Not this year. I am not entirely sure why but I managed to slow down enough to truly enjoy. I won't do a full summary but some highlights - Palm Sunday at the Wednesday night service I attend at the Anglican church - I hadn't gotten palm branches or the sing my favourite hymns on Sunday and not only did we sing some favourites on Wednesday, the priest knew that we weren't singing my favourite so she used it as the postlude. That meant a lot! Thursday night - the wonderful and meaningful service at the Methodist church and several friends were there who haven't joined us before. They held a "Last Supper" event for the kids downstairs and my children came home as impacted as I was. Good Friday - a service filled with worship songs that spoke to my heart and then, a fish dinner with very close former Catholic friends and Dh's parents. It's become a tradition for us and quite a nice one. Saturday - a Christian Seder with my parents-in-law who truly entered into the spirit. My kids LOVE doing this and having wine glasses is such an exciting thing for them. I made my own matzoh and charoset (this year's was awesome!) Click on the links for recipes. Sunday - Easter service (I got to sing with the worship team) and then a wonderful traditional family dinner with my parents. Monday - the Easter Bunny arrived and we continued the tradition begun by my parents of giving a living gift to remind us of the new life through the resurrection. My kids LOVED getting a cactus as much as my brother and I did as kids. The kids and I made hot cross buns on Friday (and they were devoured so we made more on Monday to go to school in lunches and to teachers as a treat). I love this recipe. Our Seder - I used Ann Voskamp's service and it was marvelous. My grandmother was the jello queen and we enjoy jello treats more than the average family. My kids LOVE these jello eggs and to help syringe in the jello to the egg molds. IJ loved playing chess with Uncle Josh and I was so grateful Josh would play - I hate chess and so does Dh. Two of my favourite "old girls" - mom and our old dog, Lucie. Easter baskets on Monday morning. Two very happy kidlets! I am a big podcast listener. I walk a lot and to keep myself from getting bored, I listen to podcasts. My tastes are diverse and range from everything from parenting to faith to true crime, depending on where my ADHD brain is bouncing at any time. Lately, though, I have really been enjoying one by Pete Enns called The Bible for Normal People. Recently, I listened to an episode that was a replay of an interview they had done with Richard Rohr, who is one of those names that just keep resurfacing in reading some of the people who speak most to my heart these days. I have several of his books, one of them I have read and a few others that are coming closer to the top of the to-be-read pile. He speaks on a diverse range of topics and one that has interested me is the issue of spiritual development. As a teacher with a background in child development, the idea of stages that we pass through really is a language that I speak and a reality that I see in action on a daily basis. What Rohr had to say during this podcast really interested me. He said that faith development (and I am wildly paraphrasing here, so forgive any confusion) can be seen as being three boxes. The first box is "Order", the second is "Disorder" and the third is "Reorder." The first box is something like that childhood faith we have - issues of black and white, right and wrong, binary, dualistic thinking. To spend life in that box means having a faith that is fragile and can't stand up to the hardships life throws at you. That box involves all answers and no questions and is all about certainty. Unfortunately (or fortunately for our longer-term development), that kind of faith rarely sustains us in the long term. Box two, "Disorder", is the box that represents when those ideas that we held so tightly don't work anymore. For some people, that's where they deconstruct and then either abandon faith entirely and spend life in a chaos, or, if they are lucky, start asking the questions that they need to ask to move to the third box. The third box, "Reorder", is the box in which it is safe to live with doubt, in which we move to a more mature faith, a faith that does not rely on black and white and that can exist in the grey. It's a faith that is deeper and yet, allows much more room for questions and challenges. It is a faith that can see truth in stories (even when they are not 'fact'). It is a box in which we no longer have to fear the questions and can ask, knowing that, at least here on earth, we may not find the answers but that there is beauty in merely asking the questions. I feel like that is the place to which I have arrived in my faith and yet, I haven't found a church that is there. Box one for me was the mainline church of my childhood. Contrary to the belief of many of the evangelicals around me these days, that faith was anything but dead. I come from four generations of ministers in the denomination and each and every generation had people who were passionate about God, who tried to serve him to the best of their ability and who felt called and challenged to follow Jesus. It wasn't the most exciting world, at times, but it had security and consistency and a kind of beauty that I had to reach box three to appreciate. Social justice and liturgy were very important in this system and we sang the hymns that my grandparents and great-grandparents had sung. We valued a very educated clergy and there was certainly never any unseemly emotion in a service. We lived in seasons and there was a quietness and thoughtfulness that might not be visible to the outsider but that was most certainly there. I grew up happy but with a strong sense that this was the only way and once I hit my teenage years, I began to drift. The church in which I grew up really didn't exist anymore, most of those attending either were over 70 or went because their parents told them that had to. They didn't have any knowledge of a greater Christian culture and other than Sunday morning, most of the people around me were not distinguishable as Christians when they weren't in a church. That was when I arrived at box two. Having grown up only knowing one thing, I began to question what else was out there and whether these strict definitions (and prejudices against the "born agains" and the "holy rollers") were fair. I went away to university and, for the first time, met people who called themselves Christians whose beliefs weren't the same as mine. I attended a Lutheran weekly communion service, I had friends in class who came from every end of the spectrum and I met (and eventually married) a man who had been raised in the Salvation Army and whose family were about as evangelical as you could be. I started to question so much of what I thought I knew. I started hearing names and ideas I had never heard before (some of which interested me and some of which horrified me) and I encountered scary things like "the end times" and questions about whether I was saved and met people whose lives largely revolved about faith. Their friends were evangelicals and there was this entire culture and sense of belonging that kind of appealed to me on one hand and yet that I could not reconcile to the loving God and need to accept difference that was essential to the faith of my childhood. It was a confusing time because I was trying to find something that was true to my perceptions of who I was as a Christian while also fitting in with the "right" people and not being one of those mainline "dead" people. It was a world that was rife with judgment and left me with lots of answers but not a lot of comfort with the questions. I would say that I have transitioned to box three over time probably during the last ten years after Pk and Ij were born. It has been a slow process. We moved from a more mainline (but poor fitting) church to the evangelical church in town, following their terrific children's programmes and some pretty good preaching. I began by just really viewing church as something for my kids and for community, with a sense that my faith needs would be largely unmet. I have come to LOVE a lot of music by Hillsong, for instance and to appreciate scripture that I had never really heard during the lectionary teachings of my childhood. I now have managed to find "my tribe" of progressive evangelicals online, meaning those people who do have a strong, orthodox faith on the one hand but also, a commitment to love and justice on the other. I love the fact that ours is a church at which we can do children's events because we have a large number of very committed families whose children come to programmes weekly. I have also discovered that while some hold some opinions with which I am VERY uncomfortable, generally people are kind, loving and willing to allow some space for difference. The biggest lesson for me, though, is that I belong to the family of God and not to one church or another. I used to feel that I had to be a member of one church or another and that membership made me ineligible anywhere else. These days, I go to our local evangelical church on Sunday, teach Sunday school and sing with the worship team. My kids go to a wonderful Lego programme and I do some women's things at the Free Methodist church and on Wednesday night, I go to a very traditional service at an Anglican church. It's taken me 45 years but I have come to terms with the fact that there are ways that I feel closest to God and in which I want to worship and they don't have to be the same ways as people around me. I can totally get lost in Be Still My Soul (Finlandia) during one service and weep at an especially good Hillsong selection another. I can read through a liturgy that is entirely printed out and that I read at one service and raise my hands to praise at another service. I still love liturgy and I especially find that in the evangelical church, I miss the rhythms of the seasons (I'm really struggling with the "Good Friday shouldn't be sad because we know Easter is coming" of our Evangelical church, I want to sit in the sadness of Good Friday before I arrive at the joy of Easter). On the other hand, it bothers me that the order of service at the Anglican church actually says that communion is only open to baptised believers. My children are eligible because we did baptise them as young children but almost all of the other children at our evangelical church are not baptised and would not be welcomed to take the elements at the table. I have had to learn that there is something to be taken and savoured from each setting and that, unless a church is preaching hate or heresy (and short of questioning the divinity of Jesus or the existence of God, I'd be open to at least considering quite a lot), I need to go in with ears to listen to what God wants me to hear. And anyway, there's always somewhere else to try if I need something else. It's a much more comfortable place to be when I don't question whether I might have to leave because I might just not belong because I can't check all of the boxes. In the last 24 hours, I have heard about four impending divorces. None of the couples involves are in our closest circle and yet, it's shocking to me. I know that the stats say that something in the area of 50% of all marriages end in divorce but Dh and I have been very, very lucky in that we have only had one set of friends along the way who did opt to live life apart and so I am probably very naive. It's also been on my mind as, on the last day of school before the break, a confident, smart and outgoing 5 year old girl entered the classroom, sat disconsolately on the corner of the carpet and, when we asked what was wrong, she informed us that her parents had told her that her dad was moving out on April 1st. She was despairing. I don't really know what leads to that point of needing to be apart from someone that you loved so much. I know, people change, wants change and circumstances can cause so much hurt. We have a situation in our extended family in which we discovered back last fall that a spouse had been cheating (and it was discovered in a most distasteful way!) and we have all been rocked by it. They are still together, though (although I suspect that may not be the final outcome). I am not judging, it's just that Dh and I grew up in homes where we watched people struggle through it and both sets of grandparents are now very good friends and have exemplary marriages. In our world, you just keep at it, you persevere and you hang in there. We've been lucky in that, I think, because of the God end of it, nobody ever viewed leaving as an option, so people just didn't give up. I think that has made a difference in that, when both spouses go into it with the understanding that it is forever and both are committed to making it work, it's easier. I've seen cases in which one spouse is doing all of the work of the marriage and the other is either emotionally absent or on the edge of leaving, and I can't imagine how heartbreaking that must be. It's just so sad to see all of that hope, all of those dreams and all of that love gone. It's also hard because, as a teacher, I have seen what it does to children and the kids I have taught whose parents have divorced, are so traumatized by it all. It's like a nuclear bomb has been dropped into their worlds and they spend a long, long, long time trying to pick up the pieces. I'm just musing here and again, I hope that if anyone actually reads this, that I don't come across as being judging. If there is abuse, emotional, physical or sexual, if there is hatred and quite likely, in other cases that leaving is justified, of course, things need to end. I am coming at it more from a sense of sadness and bafflement rather than of judgement or superiority. It just makes me sad to see families disintegrating. So, what does this mean for me? Well, it serves as a good reminder to me that I can't take my family or my relationships for granted. I do tend to get really wrapped up in my own head and my own day-to-day stresses and I don't prioritize time with those who are important to me. I've tried to remedy that this year by implementing a "date" monthly with each of my immediate family members - Pk, Ij and Dh. It's been fun and so far, we've had so much fun. Pk and I have gone to buy yarn and then to Starbucks to knit and drink tea and hot chocolate, to the mall for earrings and lunch and to Laura Secord to buy a Willow Tree ornament and for ice cream. Ij and I have gone to Tim Hortons and Mastermind to explore Lego and to see a big exhibit of Scouting badges from the past and to have Booster Juice (his favourite) and, best of all, Dh and I have started having a weekly t.v. date once a week after the kids go to bed and this week, since grandparents were here, we went out to our favourite Japanese restaurant and savoured a delicious lunch (and it's a restaurant we have enjoyed for about 12 years). It's critical that I make time and give them my attention and that is something from my January goals that I plan to keep as a regular thing as long as they are willing to enjoy it with me! It's been a really difficult couple of weeks at work for me. There are some very toxic people and it's been a real challenge to try to stay above it all and to, as my husband always says, "make sure that my side of the street it clean." It's so hard to keep from being drawn into other people's drama but I have been really making the effort to be calm and compassionate (which has been difficult!) I've been looking for ways to find the little pleasures in each day and one of my pleasures is knitting. The past year or so was the year of the hat for me. One of PK's skating coaches asked for a messy bun hat in "worksocks" colours which has become what the skaters refer to as the "Roots" hat. I ended up making an entire set for her synchro team and I then go requests from people who don't skate :-) Christmas was all about slippers (I'll do a post on that another time). I had a colleague ask for a bun hat but she didn't want the worksocks colours, she wanted black. The pattern that I had been using would just be too boring in black so, after some searching on Ravelry, I found a pattern that I really like. Of course, I had to make one first to check tension and whether I actually like the finished product and yes, I LOVED it. It's the Yellowstone Skate Ski Hat by Selena Miskin and available for purchase on Ravelry and I have been really happy with it. I find winter so bleak and I love lighter colours when possible so, of course, I made it in my favourite cream colour. 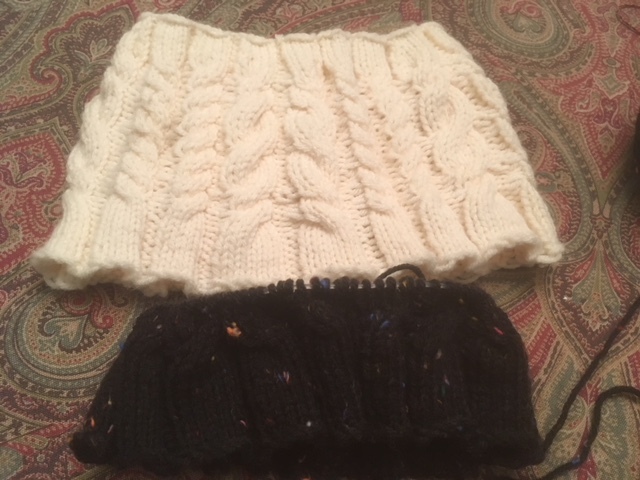 Now, I have the black one is the works and I can't wait to finish it and pass it on to its recipient. My only sadness is that the black really doesn't show off the lovely cables the way I would like. At any rate, it's cabled enough to look very pretty (and impressive to those who don't know how easy cables are) and yet easy enough that there isn't so much counting that my eyes go crossed. It's such fun to pass on a little surprise like this to someone. PK is my model so the adult size is a bit big on her but it's perfect for me!